There was a time when your family could sit down and watch a natural history documentary together. Not anymore. There is so much high stakes drama and up close imagery that at times you need oxygen to cope with it all. 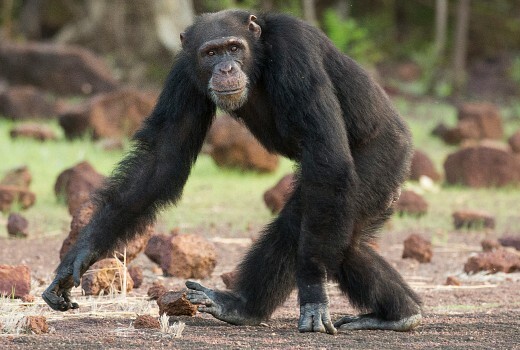 The BBC and chief storyteller Sir David Attenborough weave a tale of chimpanzees in Senegal, West Africa, like an episode of Dallas. It is dripping in drama and power games that shift it from science doco to political thriller. “Chimpanzee” is the first of 6 episodes showcasing majestic but threatened species, from the Sahara to Antarctica. Cameras follow a pack of 32 chimpanzees for 2 years, and hang their story off an alpha-male leader named “David” (so named by the crew’s anthropologist). David has ruled the pack for 3 years but now as drought strikes Africa he finds himself challenged by younger males including “Jumkin”, who has long sought the top spot, and “Luther,” a tempestuous younger male with an aggressive streak. Attenborough, seen briefly at the top and tail of the episode, describes the behaviour and power struggle that unfolds especially when females are ready for mating. But this is no mere match of brute strength, as Attenborough reminds us, the younger males are prepared to kill to claim top spot. “David” must recruit some allies, winning favour through grooming others. “You scratch my back, I’ll scratch yours,” as Attenborough puts it so eloquently. The photography captures it all, including savage, bloody fights and distressing life or death experiences. Set to an emotive orchestral score, it is impossible not to get involved in “David’s” quest to remain on top. His techniques to achieve such are practically Shakespearean in nature (or something akin to toppling a Prime Minister). But access is everything in this genre and you will feel like you are peering through the bushes as cameras capture intimate moments. “Chimpanzee” is rollercoaster of highs and lows that will have you, or possibly the Gogglebox cast, spellbound on the couch. Dynasties airs 7pm Saturday on Nine. I don’t see the problem – it’s what happens in nature (I have seen other BBC/David Attenborough docos on the subject). Sounds like our politicians in Canberra!